Jon Talton: The state of play doesn't seem to change when it comes to executive comp. But the rich getting richer is part of a deeper problem facing the system. When I was business editor of the Dayton Daily News in the 1980s we began an annual survey of executive compensation. This was a very different Dayton, Ohio, from today, with several major corporate headquarters including global giants such as NCR and Mead. The CEOs were outraged and complained to the publisher. The same happened when I moved on to the Rocky Mountain News in Denver. Maybe a last remnant of shame and prudence still existed. We published anyway. These days my boss doesn’t get a peep of protest from the moguls when the Seattle Times presents its yearly survey. And today’s executive scratch makes the compensation of the 1980s seem austere by comparison. Between 1978 and 2015 CEO pay grew 90 times faster than that of the typical employee, as middle-wage jobs have collapsed. Even in the prosperous, tech-heavy Northwest, average compensation for CEOs climbed five times faster than for workers between 2010 and 2017. This disconnect between the fortunes of the management elite and the rest of us happens despite protests against the 1 percent. Despite the fact that America is essentially at full employment but seen no real wage growth for most workers. Or that every almost Hollywood movie since 1980 casts corporations and their leaders as evil. Or that the sky-high compensation in the financial sector, incentivizing dangerous risk-taking, was one of the big causes of the Great Recession, which nearly destroyed the global economy. Outrageous executive compensation has been normalized. How outrageous? So much so that Mark Okerstrom of Expedia, the highest-paid on our list at nearly $31 million last year, is a relative dishwasher compared to Hock Tan of Broadcom, who pulled down more than $103 million. So I could spend this column ranting about greedy CEOs or how we got here thanks to the rise of stock options, whose use exploded after the late 1970s. Don’t forget poor corporate governance, loss of a progressive tax system or Wall Street’s demands for short-term results distorting incentives. But I’ve been doing that in this space for 10 years, and years before that at other newspapers. It might be more profitable to ask, where do we go from here? The Gilded Age of the late 19th century is associated with robber barons, horrific conditions for many workers, bloody suppression of unions and Jim Crow in the South. The term came from a novel by Mark Twain and Charles Dudley, describing an era whose surface was shiny but whose insides were corrupt. Our times were even foreshadowed with that era’s debate over tariffs, which Republicans supported and Democrats opposed. There was mass immigration, and anti-immigrant protests, too. Inequality was stark. The time was also marked by technological revolutions (railroads, electricity), the rise of the modern corporate model and the emergence of professional management at the top. But at the risk of generalization, the Gilded Age didn’t see corporate treasuries looted to enrich a permanent executive class. The big money went to the robber barons and their cronies. Upper management wages were more modest: Enough to boost a middle class and better than those toiling in factories, but not what we see today. Sometimes history doesn’t even rhyme. The Gilded Age spawned a genuine populist movement with William Jennings Bryan, three-time Democratic nominee for president. Although Bryan failed, the discontent against “the moneyed interests” resulted in reform. For example, government regulation of railroads was approved by Congress in 1897. The anti-monopoly Sherman Antitrust Act was passed three years later. After the turn of the 20th century, Progressives in both parties went even further, such as President Theodore Roosevelt’s trust-busting and President Woodrow Wilson establishing the first income tax (on the richest). Despite the interregnum of the Roaring ’20s, the Gilded Age was dead. In its place, a broad consensus emerged about American capitalism. It worked best with big business balanced by government and unions. From the 1940s through most of the 1970s, prosperity was widely shared and incomes grew for people at all levels. Chief executives were paid well, but relatively modestly by today’s standards. For example, “Engine Charlie” Wilson’s compensation as head of General Motors in the early 1950s was around $5.7 million in today’s dollars. Basic GM assembly line workers made at least $19 an hour, plus overtime and benefits. Most skilled workers and supervisors made much more. The consensus broke down for many reasons, including the “Reagan revolution” seeming to pull the country out of late ’70s stagnation. But with that dynamism came a rougher capitalism, an emphasis on short-term shareholder “rights” and the rising belief that CEOs must be highly rewarded. Never mind that these rewards often came whether the chief executive performed well or not, or whether the outcome was in the best interests of the nation. Our Digital Gilded Age offers rising inequality, the collapse of middle-wage jobs, housing unaffordability, and a sharp division in how capitalism rewards investors and the corporate elite compared with everyone else. It presents less misery than its predecessor because of the previous reforms and social advances still in place. Perhaps the biggest difference between the eras is the lack of a powerful reform movement today that could take on such abuses as too-high executive compensation. Sure, both the left and the right have their hot buttons, and the left protests loudly in safe blue cities. But neither focuses in on how, say, top executives are rewarded for closing plants, keeping employment and wages down, merging away competitors — all to keep the stock price up. Remember, the shift to exorbitant pay at the top happened with both Republicans and Democrats in the White House. The allegedly liberal Democratic majority in Congress from 2007 to 2011 failed to seriously address it. The weak Dodd-Frank Act requires that public companies disclose the ratio of pay between CEOs and their typical employee. But to what end? More than 30 years of similar “reform” attempts (remember the rise of independent board compensation committees?) have failed. Sunlight doesn’t equal change when it comes to the gilded C-Suite. In fact, the nation is moving in the opposite direction. Taxes were cut by Republicans, especially for the wealthy. 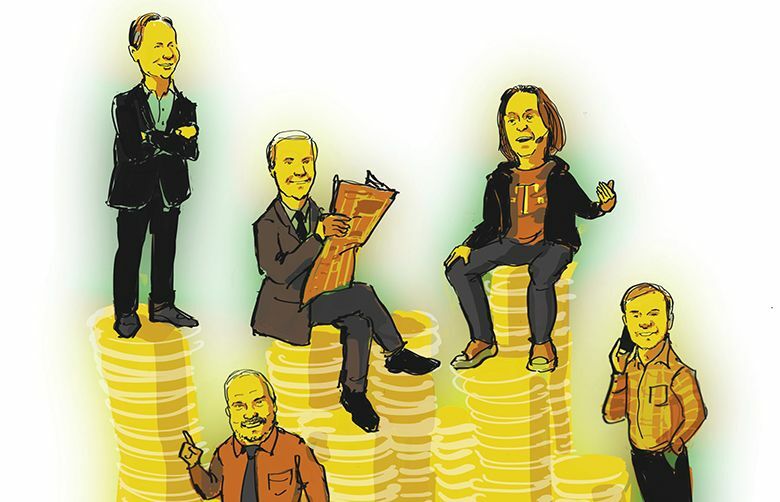 CEOs make up a large share of the highest earners. A big increase in the tax for this tax bracket could do much to help ease inequality, especially if the proceeds were invested in job-creating infrastructure. Meanwhile, President Trump has used one slot to gain a conservative Supreme Court majority. Now he has another opening. If he succeeds with help from the GOP-controlled Senate, this will be the most pro-big business high court since the first Gilded Age. Count on the majority of justices to slap down any attempt to reduce runaway executive compensation. Add in the Citizens United ruling that allows unlimited corporate money in politics to protect corporate interests, and this is America’s reality. We’ll keep publishing how much CEOs make. Many of them are perfectly nice individuals. Together, however, their extreme wealth is one symptom of a society pulling apart. It can’t end well.